Find My Workspace lists over 95% of the executive office suites market in Philadelphia. Simply click Request Quote to check pricing for one office, or Add to Basket for multiple offices. This space provides affordable, flexible term offices, dedicated desks, conference rooms and hot seats. With an eco-friendly design and intimate business environment that facilitates collaboration. There are soundproof phone booth, modern kitchenette, ample windows, welcome natural light, unlimited coffee and fresh fruit waters! With curate networking opportunities, connecting you with like-minded entrepreneurs and set the picture-perfect work day. Members Perks include a perfect location for walking and public transportations. Restaurants and cafes steps away from our office. Directory listing in our front door, designated mailbox, receptionist, conference room reservations, guest passes, printers, wifi, and more! Offering uniquely designed private and shared office space, this large co-working provider and corporate installation is the perfect venue for those professional clients and prospective tenants looking for a more relaxed working environment. The space features great facilities such as lounge areas, and a fully stocked kitchen area. The space prides itself on being a community led and vibrant corporate environment, filled with like-minded professionals and functioning as the region’s foremost premium workspace venue, perfect for networking and building relations as well as achieving the highest standards of success and productivity. We are located on the 10th floor in a Class A building loaded with amenities and central to the financial and legal heart of the city. Our brand-new offices include Herman Miller furniture with file cabinets and lamps. Tasteful artwork on the walls. Integrated phone system to our front desk Intelligent Assistants. All offices include phones with full reception services, Internet both hard wired and Wi-Fi. All utilities are included as well as full use of our kitchen. Well equipped conference rooms are also available, and the building offers a host of amenities. Offering private offices, coworking, shared workspaces and common areas in a focused work environment for business growth, this center is in the heart of Center City. Occupying four floors and a 2,000 square-foot roof deck with panoramic views of Philadelphia, the space is designed to encourage collaboration and innovation while preserving the unique character. 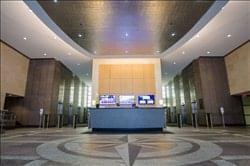 Open, well-lit floors are enhanced by state-of-the-art offices and amenities, such as 24-hour access, bike racks, copying facilities, WiFi, IT support, main handling & postal facilities and staff on-site 7-days a week. 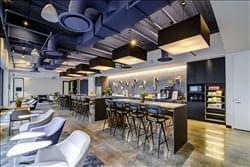 This center takes pride in having built a home for world-class companies and world-beating talent — appointed with the finest amenities, world-class hospitality services, state-of-the-art technology, award- winning chefs, and the finest design touches in a distraction-free environment. This center is generously designed for teams and/or companies of 16-42 people, providing 24/7 secure building and office suite access, premium office furniture, and access to centers worldwide. The memberships feature shared desk access to every WorkPlace location. Stop in and visit this center today and find what is best for you. This innovative center is located in the heart of Philadelphia extremely close to Center City. The center provides fantastic collaborative workspace with beautiful, private glass offices for up to five people and shared space for those that wish to collaborate. The center offers fantastic 360° views of the city and gives all tenants access to an energizing community that spans more than a dozen industries, with great amenities such as lounge areas, phone rooms and a mother’s room on-site too. 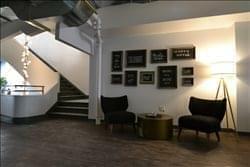 This co-working space on South Street has an intimate boutique flavor while providing plenty of room for members to work, collaborate and relax. Communal areas include café style tables, plush couches and seats throughout the space, phone booths, and conference rooms. The pricing is all inclusive of 24/7 access, WiFi, conference rooms (no credit system), one phone per private office, mail & package reception, BW printing/copying (just bring your own paper), coffee, beer, soda, fruit, snacks, lounge, credit with AWS, discount with UPS, and many other benefits. If you’re serious about your work, join this community and they’ll help you grow. This isn’t just a workspace, it’s a place that is committed to member’s growth. This center provides the infrastructure for established and emerging organizations seeking to change the world for the better. This community space brings together socially and environmentally conscious entities, emerging technology companies, humanities-focused non-profits and creative individuals. 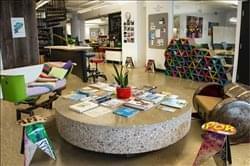 A great space that provides a backbone to the growing body of work in Philadelphia’s impact and innovation economies. this location is in the in the heart of Philadelphia between University City and Center City, one block away from the Schuylkill River Park, a 10-minute walk to 30th Street Station, and are accessible via several public transit lines. To obtain information for your selected Pennsylvania Executive Office Suites, please tick the "Add to basket" box for each office you prefer and complete the form below. We will then send a detailed report via email.